Lorraine and John invite you to share their excitement as the saga continues. Drop back for updates on the little ones. This page contains Lorraine's journal of "the pregnancy". It all started out with a bad case of strep throat. Arianna had it first, then Kaylin and then of course me. When I went to the doctor for antibiotics something told me to ask him if they were OK to use just in case I were pregnant. I took the antibiotics and the strep went away. I was so preoccupied with the families ailments that I hardly realized that I was beginning to feel a little bit different. Upon telling this to a neighbor, she immediately sent her daughter over with a pregnancy test. At the time there was the normal nervousness and anticipation of the results. Obviously, now there is no suspense in the retelling. It was Tuesday, August 17, 2004. We were busy yet again. Our annual trip to NY was scheduled for Friday, August 20 through Sunday August 29. I was excited about sharing the good news in person to the immediate family. We enjoyed a fun �Family Party� on the 21st and all was fun until about mid-week. I began to feel downright lousy and this unfortunately lasted through about 18 weeks of pregnancy. I had never been so sick in all my life. I was nauseated during my first trimester with Arianna and Kaylin but this was downright torture. Food just didn�t want to stay down! Why was my condition so awful? Was it because of my age or was it my physical labor job at UPS. I had heard that people are sicker with multiple birth pregnancies. Could I possibly be carrying twins? John was fairly convinced that I might be, partly because of my poor physical condition (pregnancy symptoms tend to be worse with multiple gestations) and partly because he had sort of a premonition dream in which he was playing in the yard with twin boys. It's September 21, I'm about 10 weeks along and it�s time to see the doctor. After the miscarriage from last year, we were anxious for the ultrasound to make sure that everything looked right. Tears came to my eyes as we saw the little arm and leg buds and the flickering of the perfectly beating heart. What relief! What joy! What�what is that? There is another baby in there! John's premonition is true! Twins! But wait WHAT IS THAT??? Is it a reflection in the ultrasound machine or is it OH MY GOD ANOTHER BABY! No way! There can�t be three in there? This doesn�t happen completely naturally very often. Another doctor is brought in to verify the diagnosis. Yup! There are three in there for sure. John and I are in a state of shock. How could this be? We were of the assumption (you know what happens when you assume having three children in all, NOT three additional children! Well, unbelievably, right after we were told the news a very strange sense of calm came over us. It became so apparent to us that for some reason this was God�s will for us and our job was to trust in Him and all would work out just fine. John and I felt so overwhelmed, yet so unbelievably blessed at the same time! On September 29, 2004 we had our first appointment with Duke Perinatal Consultants whom we were referred to as a result of my high-risk pregnancy. It was confirmed that two of the babies are sharing a single placenta which means that they are identical and one baby has it�s own placenta. Apparently, at the time of conception I dropped two eggs that were both fertilized. One of the eggs split further resulting in three babies, two of which are identical and one fraternal. It�s November 3, I�m almost 16 weeks along and it�s time for my first level-2 ultrasound. Hurray! The babies all look good. There is no indication of genetic defects and they are all growing at the proper rate, all measuring around the 16-week mark. We are so happy, but we're also in for one more shock. After having two girls we are surprised to find that the �triplets� are all BOYS! Wow! The routine is to go to the doctor every two weeks for a check-up (which always includes at least a brief ultrasound since there is no other way to check for all three heartbeats) with a level-2 ultrasound every four weeks. December 13 is the day that we have an exam and tour of Duke University Hospital. This is where the babies will be delivered. The �boys� continue to look good and the tour goes well. However, both John and I are a bit intimidated by the sheer size, businesslike and sterile atmosphere of the place. It�s a long walk and tramway ride just from the parking lot! January 28, 2005 and the �boys� are 28 weeks along today! Yay! We made our first milestone. Statistics show that by 28 weeks gestation babies have a 90% survival rate without long-term complications. Of course, we want to make it to 36 weeks--at which time the doctors will schedule a C-section--but we are pleased with getting to this point without any complications thus far (besides a little �spotting� incident a week before Christmas). Today I spent 3 hours in the doctors office getting poked and prodded. Blood was drawn from both arms, one for a gestational diabetes test and one for a test of my liver since I�ve been experiencing lots of itching! I also received a Rogam shot in my right hip muscle since my blood type is RH negative. The good news is that we had another level-2 ultrasound and everything continues to look great! Today the �boys� measured 2.4, 2.6 and 2.9 pounds! We (both John and mom were there) could see the babies opening their eyes and putting their hands to their mouths. How cute! 21 weeks pregnant - waist 37"
22 weeks pregnant - waist 38"
28 weeks pregnant - waist 41"
24 weeks level 2 ultrasound - babies approximately 1.5 pounds each. 28 weeks level 2 ultrasound - babies approximately 2.4, 2.6 and 2.9 pounds each. Saturday, February 26,2005: THEY'RE HERE! 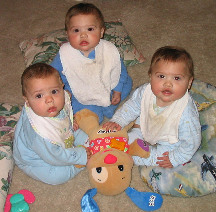 "Matthew, Mark and Luke Klein were born this morning, Feb. 26th, shortly after midnight, at Duke Medical Center in Raleigh NC. They weighed in at 3 lbs. 10 oz, 3 lbs. 8 oz and 3 lbs. 9 oz." "The three boys and their mom, Lorraine, are all healthy and (according to daddy John, who participated in the birth) very beautiful." "We all thank everyone for your many prayers and good wishes, and invite you to join us in thanking God for this wonderful gift."